Iron Braydz got tagged in by Dubbledge. Find out who gets tagged in next…. Skyzoo’s “Theo VS JJ (Dreams vs. Reality)” is a prelude to Skyzoo’s upcoming album “A Dream Deferred,” out October 2 on The Faculty / Duck Down Music Inc.
Song produced by Jahlil Beats. Video directed by Pacool for Chancleta Films. “Slash Gordan” is the lead single off Murs & Fashawn’s upcoming album ‘This Generation,’ out 25th September on Duck Down Music. Man Bites Dog Records present Copywrite’s “Ghost in the Machine” Official Music Video off of the album God Save the King the Proper English Version. The Song features rising UK artist Context and is produced by Jason Rose. Latest Baron Samedi video taken from his forthcoming EP Ghost Network 3. Track produced by Baron Samedi. Video shot by Hari Datta, and edited by Baron Samedi. ‘H.I.Y.W’ is the debut solo single taken from Carasel’s forthcoming album ‘Progression’. Laying down the marker with a strong statement of intent and a stern message. ‘Hate If You Want’. Produced by Bristol tastemaker Blacksmith, this brand new anthem drops hard as Carasel effortlessly rides the beat breaking down the message for any doubters. This is the first track to be taken from the album and is already being championed by some of the UK’s biggest deejays. 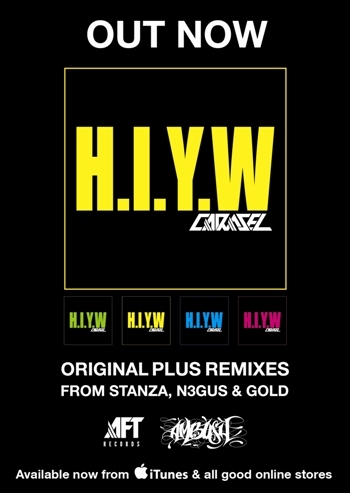 With remixes to come from Ambush family member N3GUS, Hospital Records recording artist DJ Stanza and Birmingham’s Gold providing an old skool 2-Step UK Garage banger this is one serious release you don’t want to sleep on. Carasel has also recently received BBC1Xtra support from DJ Bailey who has championed the track ‘Coming Home’ which features Dynamite MC & Eksman.